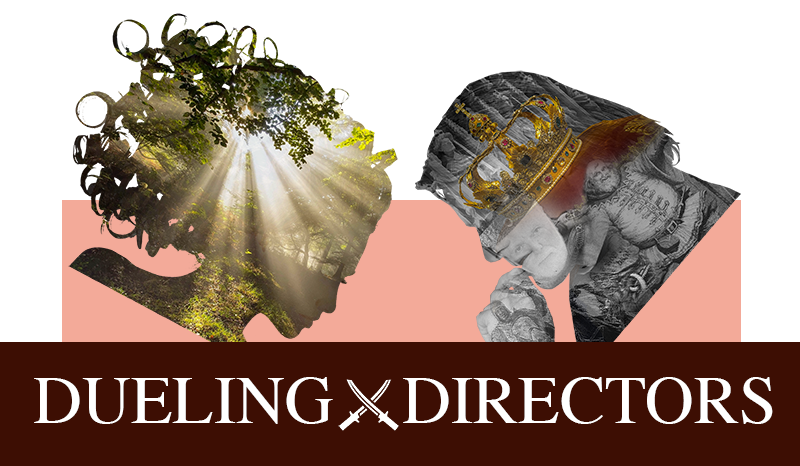 ASSIsTANT Director SOPHIA RAY interviews 2018 Season Directors Liz Carlson-Guerin (AS YOU LIKE IT) and David girard (HENRY IV) on their approach to their respective plays, and what they're looking forward to this summer. SR: Can you describe your approach to AYLI/H4 in five words? What would it be and why? LCG: Can I do it in one? Collaboration. We’ve assembled an amazing group of actors, designers, musicians and technicians this year - and we are all building the world of the play together. We have an extraordinary Young Professional Company at Saratoga Shakes and they have been instrumental in creating the movement and music language of the world. As You Like It has such a strong sense of community at the core of it and I wanted to reflect that in the way that I approached working on this play. DG: Hmmmm... Transformative. Passionate. Collectivist. Clear. Active. If you ask tomorrow, I'll have five different words. SR: Do you have a favorite character from the play you are directing? Who is it and why? LCG: As You Like It is packed with amazing characters - Rosalind is a phenomenal and fun role, Jaques has one of the great speeches (‘All the world’s a stage’), Phoebe is always a crowd-pleaser - but I have to say, my favorite character in this play is Celia. She sacrifices her security and home to go on this dangerous journey with Rosalind and ventures entirely outside the world she thought she belonged in and becomes Rosalind’s protector and her truth-teller in the Forest of Arden. Both Rosalind and Celia are incredibly smart and funny and their relationship is so truthful and generous; that selfless love of Celia for Rosalind is one of the things that really drew me to this play. DG: Falstaff. Although Henry IV is a very close second. And Hal's journey is amazing… Hotspur's language is so active! Falstaff is one of those figures in Elizabethan theatre that is enigmatic, so much so, Elizabeth I instructed Shakespeare to write another play with him as a character (that’s how we get a very slightly incongruous Falstaff in The Merry Wives of Windsor). Hal’s journey via his relationship with Falstaff, and finally through his father, is what interests me most about the play. Fathers and father-figures, and those relationships between kin are important to ground to tell the story of this play. This is definitely an actor’s play. SR: In terms of relevance, how do you feel your production of AYLI/H4 will relate to modern audiences? Or, in other words, why this play now? LCG: This is a play about a complex and broken world, a world that is divided in two. As You Like It grapples with both how to live in and how to heal such a space. It deals with shifting perceptions, forgiveness and reconciliation and learning how to truly see one another and ourselves. This strikes me as a very present idea for our time. DG: This production is grounded in a more recognizable world for the audience. It should feel familiar. It's a more refined reflection of the society we live in. Our casting, particularly gender roles, purposely revitalizes and reconstructs (or rather, deconstructs) several relationships in the show. The power struggle in this play, mirrors our world, not just nationally, but globally. We’re being forced into reevaluating our allegiances and loyalties. It’s a very relevant topic that the Henriad captures quite effectively. SR: How does your production of AYLI/H4 relate to Saratoga Shakespeare's "Season of Transformation"? Transformation is key to As You Like It: each of the characters goes through a massive transformation. In the play the Forest of Arden serves as this dangerous, freeing space where that becomes both possible and necessary. Woody Proctor (Orlando), Wesley Broulik (Touchstone), Gwynned Vetter-Drusch (Rosalind) and Savannah Jackson (Celia) from As You Like It. DG: Hal’s journey from raffish Prince to a King is certainly transformative. It is, first and foremost, a coming of age story – this also includes Hotspur’s own track. Hotspur has a legitimate gripe with Henry, the decision to rebel is a massive decision with profound repercussions. The stakes don’t get any higher. I also think how we track Henry, and his own self-reproach and the regret he has in the way in which he came to power – I mean, he’s desperate to cleanse his soul in a crusade; he’s ready to escape England to purge himself. His evolution at the end is very clear. He’s penitent and finds a strange grace. That moment between father and son Hal and Henry is lovely. I love how all those ideas are played off one another. And I’m thrilled I have the actors to pull it off. SR: Both shows this season will feature an element of live music, why did each of you decide to incorporate live music into your plays? LCG: As You Like It is full of songs - so really, Shakespeare decided the play needs live music - and there are specific characters in the play who bring the music into the world. We also have a company full of wildly talented musicians, including Raya Malcolm and Andria Rabenold, who have composed all the live music in the play! DG: Because I love rock n roll, and I think Eastcheap, and particularly the Boar’s Head, needs an underground, edgy, other-side-of-the-tracks vibe. Make no mistake, this is a dive bar. It’s the end-of-the-night bar that musicians go to after their gig. SR: And finally, where is your favorite place to eat in Saratoga Springs and why? LCG: One thing I look forward to, coming to Saratoga in the summer, is Stewarts! I go there every morning before rehearsal and get a huge coffee and sit and think about the work we’re about to do. It’s nice to get outside the bubble of the rehearsal room for a little bit every day, its my Saratoga Shakes ritual. I love $1 Oyster Night at Sperry’s – Mmmmmmm. If you’re looking for a great breakfast, I really love the Country Side Café. SR: Thank you Liz and David for sharing your thoughts with us! And thank YOU, voracious reader, for spending time with us. For more information on our 2018 Season, check out our Season Page and Visit our 2018 Company to read about all the great performers we have working with us this year!